Image provided by Sphelar Power on December 11 shows small spherical solar cells woven into a piece of fabric. The new fabric is made of wafer-thin solar cells woven together that could see people powering up their electronics with their sweater or trousers. 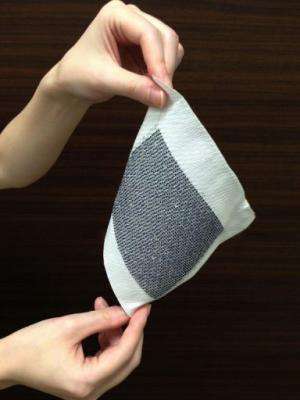 Clothes that could literally light up your life were unveiled Tuesday by Japanese researchers who said their solar-cell fabric would eventually let wearers harvest energy on the go. But its creators conceded there was work to do before taking the fabric to market. "We still have things to solve before commercialisation, such as coating for the conductive wires and improving the fabric's durability," said an official at the Industrial Technology Center in central Japan's Fukui Prefecture. "But we've already been contacted by electronics makers, blind makers and others who showed interested in our invention." The centre developed the fabric with a Kyoto-based solar cell maker and other private firms, the official said. Solar power generation is attracting renewed attention in Japan as the country looks to alternative energy sources in the aftermath of last year's tsunami-sparked atomic crisis, the worst nuclear accident in a generation. How about for a beach umbrella. Sitting on the relaxing while my shade helps power the world. Cool. Combine this with wireless charging technology and your cell phone charges while it's in your pocket. I already get ZAPPED every time I touch metal in my house. I would like to harness all the zapping static electricity. I bet I can power a skill saw with it!!! Now they want me to "fry" myself while wearing solar power clothe.